In interleaved memory organization, consecutive words are stored in consecutive memory modules in ________ interleaving, whereas consecutive words are stored within the module in ________ interleaving. 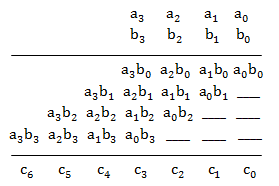 → Consecutive words in consecutive memory modules in low order interleaving as the lower order bits determine the module. → Consecutive words in same memory module in high order interleaving as the higher order bits determine the module. ∴ The no. of 1's is 9. Using the 8087 arithmetic coprocessor with the 8087 CPU requires that the 8087 CPU is operated ________. PASCAL is out of syllabus. The arithmetic expression : (a + b) * c - d / e * * f is to be evaluated on a two-address machine, where each operands, the number of registers required to evaluate this expression is ______. The number of memory access of operand is __________. ** is used for exponentiation. So, in total 3 registers are required and 6 memory operations in total to fetch all operands. A given set of processes canf th be implemented by using only parbegin/parends statement, if the presedence graph of these processes is properly nested. If the longest chain in a partial order is of length n then the partial order can be written as a ______ of n antichains. Suppose the length of the longest chain in a partial order is n. Then the elements in the poset can be partitioned into a disjoint antichains. The maximum number of possible edges in an undirected graph with a vertices and k components is ________. N vertices and K components. To get maximum, take one vertex each for each component, except last component. Now, k-1 components have 1 vertex each and so on edges. Buddy system: The buddy system is a technique to allocate the memory by dividing the memory into partitions to try to satisfy a memory request as suitably as possible. Pointer type: Garbage collector dereference the dangling pointer. In synchronization, there is a less chance of hazards but it can increase the delay. Then the advantage is ease of avoiding problems due to hazards. Virtual memory is independent of size of main memory and depends on available secondary storage. MAR can hold the address that is generated from CPU and limits the total virtual memory address space. Though the edges are sorted still due to finding union operation complexity is O(m log n). acts as a link between compiler and user program. Recursive descent parsing cannot be used for grammar with left recursion. The intermediate form the representing expressions which is best suited for code optimization is the post fix form. A programming language not supporting either recursion or pointer type does not need the support of dynamic memory allocation. 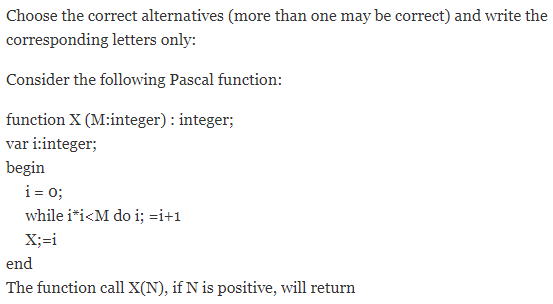 Although C does not support call by name parameter passing, the effect can be correctly simulated in C.
No feature of Pascal violates strong typing in Pascal. (A) It is true. 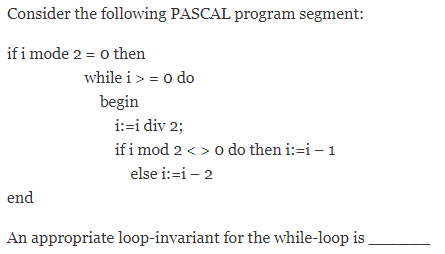 Left recursive grammar if used directly in recursive descent parsing causes an infinite loop. So, left recursion must be removed before giving to a recursive descent parser. (C) It is false. The language can have dynamic data types which required dynamically growing memory when data type size increases. (D) Is true and using macro we can do this. (E) Out of syllabus now. The amount of virtual memory available is limited by the availability of secondary storage. Any implementation of a critical section requires the use of an indivisible machine-instruction, such as test-and-set. The LRU page replacement policy may cause hashing for some type of programs. The best fit techniques for memory allocation ensures the memory will never be fragmented. (B) Is false, because one of the solution is Peterson's solution which is purely software based solution without use of hardware. (D) False, memory can get fragmented with best fit technique. For the propositional formula A→B to be tautology the T→F condition should never arise. So, in option (B) it is saying that F< sub>1 ∧ F2 is not satisfiable means F1 ∧ F2 is always false. And False → anything is always true. L(s) ⊆ L(r), because 'r' generates all strings which 's' does but 'r' also generates '101' which 's' does not generate. L(s) ⊆ L(t), because 't' generates all the strings which 's' generates but 't' also generates '0' which 's' do not generates. (B), (C) and (D) are true. But the strongest answer would be (D), a regular language. Because every finite language is a regular language. And, regular language ⊂ context-free ⊂ context-sensitive ⊂ Turing recognizable, would imply that regular language is the strongest answer.